Rugby Swimming Club’s Masters team proudly represented Rugby and Great Britain in the FINA World Masters Championships in Budapest, Hungary. The team (Diana Andrew, Julie Bowler-Smith, Zoe Medgett, Alison Richardson, Kay Ridler and Joyce Williams) who were only established three years ago, performed their ‘Grease’ medley routine (choreographed by coach Diana Andrew) in the 40-64 year old team combination event and achieved their personal best score, being ranked 10th in the World. Enthusiastic friends, family members and their Team Manager, Dawn Broad, cheered the team from the towering spectator stands located in the spectacular grounds of the winter-time ice-skating rink, overlooked by the spectacular Vajahunyad Castle which had held the elite World Championships two weeks previously. “The competition was a fantastic experience to be part of. We were elated to hear the cheers and to see the union flag flying patriotically for us as we swam our hearts out,” explained Julie Bowler-Smith. Having been inspired by the routines performed by the other teams in the age group from around the world and further motivated to continue improving their performance, the determined team are ready to work towards achieving an even higher score and another new PB at the National Masters competition here in Rugby in November. 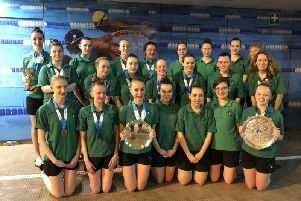 Anyone (male or female, aged 18+) who is interested in trying out synchronised swimming is welcome to contact the club’s Head Coach Hannah Secher (dudz23@hotmail.com or 07958617059) to find out about the sport and a Masters taster course. # Rugby’s Elaine Bromwich competed in the 17th World Masters Swimming Championships in Budapest, finding it a fantastic City to visit with all of it architecture and beautiful parks. There were over 10,000 competitors, with 120 water polo teams, synchronised swimming, diving fixed and spring board, open water swimming and, of course, over 3,000 swimmers who had to be over 25 to take part. The oldest was 96 years old. There were two venues for the swimming, with entrant split into four age categories which determined where they swam. Elaine competed in the Duna Arena in the Pest area, where the Fina World Championships took place just a month ago and where Adam Peaty broke his world records in breaststroke events. “It was an honour to swim there,” she said. “There were two 50m pools for competition and two 25m pools to warm up in, all indoors, plus two outside pools. Elaine, who competes for Birmingham Masters, achieved three medals. Her resuts were: 4th 50m breaststroke, 5th 100m breaststroke and sixth 200m breaststroke in 75-79 age group. All times were her best for this year. She also competed in 400m freestyle, finishing 7th and 800m freestyle placing 9th. Four of her team mates competed in the mixed 240 -279 age group, 4x50 medley and 4x50 free relays, winning both in new world record times.